Need something beautiful and tasty for a New Year’s celebration? Voila. What better way to ring in the new year than with a glass of champagne in one hand…and another hidden in your cupcake? 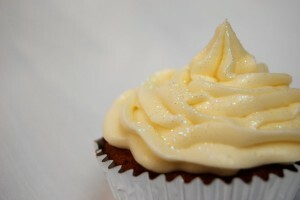 These are a moist, champagne-scented cupcake with a decadent champagne buttercream. Cake, frosting and champagne? I much prefer a sweet (vs. dry) champagne in these. If you can find a strawberry champagne, run (don't walk) directly to the checkout counter and purchase two bottles--one to drink and one to bake with. Oh, and the secret to the sparkle is edible glitter. You can find it in the cake decorating aisle of most craft stores. To make frosting, cream sugar and butter with an electric mixer. Mix on low until well blended, and then on medium for another two minutes. Add vanilla and champagne, beating on medium for another minute. Spread or pipe directly onto cooled cupcakes. Sprinkle with edible glitter if desired.